Press coverage of "Finding Fernanda" and "The U.S. Embassy Cables"
The Society of Professional Journalists, Northern California, has presented a James Madison Award for champions of the First Amendment and freedom of information to Erin Siegal in the "Author category for her investigation of human rights abuses in Guatemala’s adoption industry, as well as the U.S. government’s role, in which children have been stolen, sold and offered as orphans to well-intentioned Western parents. Her book, “Finding Fernanda,” has received wide acclaim." heartedly in Christian love and faith, until the dark side of international adoption shattered their trust. "Finding Fernanda" is Siegal's first book. Learn more about Siegal's extensive investigation of fraud, corruption, and child trafficking in international adoption between Guatemala and the United States at FindingFernanda.com. 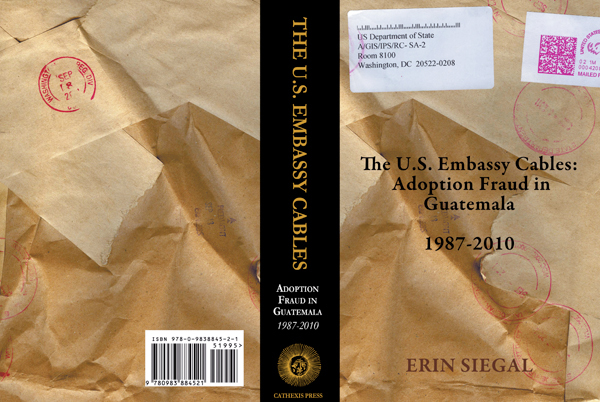 For the first time, the public is given access to revealing information written in cables about international adoption that traveled between the U.S. Embassy in Guatemala and U.S. Department of State from 1987 until 2010. These cables document the ambiguous moral and legal terrain that U.S. officials navigated amid their awareness of rising levels of fraud, corruption, and criminality practiced by those involved at many levels with adoption in Guatemala. 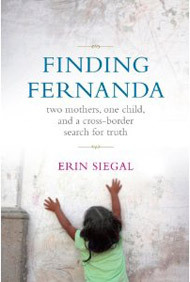 Erin Siegal, author of "Finding Fernanda: Two Mothers, One Child, and a Cross-Border Search for the Truth," combed through 2,000 pages of records and cables that, due to delays in the State Department’s response to her 30 FOIA requests (filed between 2008 and 2010), were not given to her until after "Finding Fernanda" was written. (She recently wrote in the Columbia Journalism Review about the barriers she and other journalists encounter with delays in FOIA requests.) Siegal decided to share these raw-source documents in a 718-page (three volume) e-book so other journalists, policy makers, adoptive families, and adoption advocates have access to this valuable information. What follows are key findings Siegal unearthed as she studied these cables. For the first time, cables between U.S. Embassy officials and the U.S. State Department provide conclusive evidence that as far back as the 1980s officials with the U.S. Embassy in Guatemala communicated to the State Department their knowledge that Guatemalan children were being bought, sold, and kidnapped so that American families, believing the children were orphans, could adopt them. Revealed in these cables is the evolution of systemic corruption in international adoption between Guatemala and the United States. It becomes clear in these documents that some U.S. government officials knew about illegal practices in obtaining and processing “orphans” before Guatemalan adoption grew to become a multi-million dollar industry. Furthermore, American families in the process of adopting these children, were not informed about the depth and scope of the problem. Birth mothers who met “violent” and “untimely” deaths after refusing to surrender their children, crimes that embassy officials acknowledged in these cables. Various schemes used by adoption facilitators and lawyers to separate Guatemalan children from their birthparents; then, as "orphans" these children were made available for adoption to unknowing American prospective families. In their entirety, the cables demonstrate the high level of awareness U.S. officials had of adoption-related criminal complaints that were “lost” or “misplaced” by corrupt Guatemalan authorities who held positions in various key institutions, including the Guatemalan Solicitor General's Office (PGN), which the U.S. Embassy continues to rely on to approve the legitimacy of adoption cases. A common thread woven throughout these cables are the recurring concerns the cables’ authors raise about U.S. culpability and “moral and legal” liability related to “aiding and abetting child trafficking” in adoption. The cables outline a history of conflict and struggle between the U.S. Embassy in Guatemala and State Department officials in Washington, D.C. State Department officials sometimes failed to respond to serious concerns and, at times, stonewalled efforts meant to provide greater safeguards against child trafficking in adoption. Recommendations pertaining to DNA testing: In a February 1995 cable, a U.S. Embassy official in Guatemala outlined the procedures and results of DNA testing done to resolve claims made by women who claimed to be a child’s birth mother. Questions concerning moral and legal obligations when criminal activity is suspected: Before staff at the U.S. Embassy in Guatemala transitioned, one embassy official wrote a cautionary memo in June 1995 about the staff's increasing awareness of fraud and corruption running through the adoption process in Guatemala, and the resulting pressure for U.S. officials as they tried to respond to demands by U.S. adoptive families for more and faster adoptions. Reaction to one birth mother's attempt to regain custody of her child: In this November 1996 cable, a U.S. Embassy staff person describes a case involving a birth mother whose child was taken from her, reporting that she had made “repeated attempts to regain custody” and discussing actions that attorneys in Guatemala and the United States took to block this birth mother’s efforts.